This is the third in a series of short posts for Easter this year looking at film portrayals of the resurrection. The idea is to take each of the Gospels in turn and look at one or two films that have sought to portray the resurrection in a manner that fits with that particular Gospel. Yesterday I looked at the resurrection in Mark's Gospel and so today it's onto Luke. There are three Jesus films that strike me as reflecting something of the ending to Luke's Gospel. Firstly there is the recent Lumo Project version The Gospel of Luke (2016). A few of the relevant scenes from this film can be viewed online. This time the narrator is Richard E. Grant, but it's obvious that much of the footage - at least of the initial resurrection is that we find in their version of Mark (and indeed John). As I say in my review of Mark there's an interesting tension in this between reflecting the distinct portrait of these events that Mark provides and the purported historical events that stand behind them. But one of the disadvantages of this approach is the footage doesn't always act out clear stage directions from the text, so here there are no men in dazzling clothes and no-one puts their face to the ground. 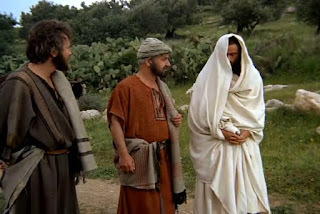 The Road to Emmaus scene is new though and as with other films has Jesus half covering his face to explain why Cleopas and his companion don't recognise him. This seems to me to be a rather odd approach. If Jesus meant to conceal his identity surely he could have done it more effectively: If he meant to be visible then why not make it more plain and uncover his face? This halfway house just makes it seem like a key test of faith is the ability to recognise faces in bad light. The second film to mention when talking about Luke's resurrection is the Genesis Project's extended version of Luke's Gospel, from which the Jesus film (1979) was edited. This also employs the partial face covering tactic on the Road to Emmaus (pictured), but does present the other aspects more or less as directed. I don't really like the soft focus in the upper room scene though. Lastly, as films go, I tend to think The Miracle Maker (2000), whilst a harmonised Jesus film is a fairly Lucan take on proceedings. That said after the resurrection the script seems to switch to John as the primary source, such that there are a further 3 episodes not found in Luke. However, the shape of the narrative at this point remains Lucan with the discovery by women, Simon seeing Jesus (24:34), the appearance on the Road to Emmaus, and then just a single appearance to the disciples in the upper room. The Johanine inclusions are more flourishes within that broader narrative than the text that defines the text of the narrative. For whatever reason very few films feature the Road to Emmaus episode, although this has increased in recent years, but this is certainly the first film I think of when this episode comes to mind. Again we get the same tactic with face-covering. The one portrayal of this scene that does something different is the BBC's The Passion (2008) which uses a different actor in various parts of the resurrection episode - certainly a more interesting, and not necessarily a more controversial, way t solve the question of why Jesus was not recognised.